On the third Sunday of Lent, the Church celebrates the Veneration of the Holy Cross. The commemoration and ceremonies of this day are closely parallel to the Feasts of the Exaltation of the Cross (September 14) and the Procession of the Cross (August 1). The most common icon associated with this day is the same one used on the Feast of the Exaltation the Cross – for an icon explanation, visit our resource page for this Feast. The Sunday of the Veneration of the Cross is wisely and lovingly placed in the middle of the Lenten season to remind us that we are not alone in our spiritual struggle – our Lord is here, with us, and His Cross gives us the strength and courage to continue ‘the good fight’ in anticipation of His Passion and the glory of His Resurrection. At the conclusion of the Matins or of the Divine Liturgy, the Cross, positioned on a tray surrounded by basil or flowers, is taken in solemn procession through the church. The tray is then placed on a table, and the hymn “We venerate Your Cross” is chanted (see Background section below for the hymn text). At the end of the service, the people venerate the cross and receive the flowers or basil from the priest. Our Lord said: “If anyone desires to come after Me, let him deny himself, and take up his cross, and follow Me” (Matthew 16:24). For Orthodox Christians, this means following a path of love, patience, humility, self-control, and obedience. Our Lord died on the Cross, but then He was resurrected; so the Cross is now the symbol of His Divine Glory. Our Lord’s Cross always protects and strengthens us. We wear a cross and make the sign of the cross to show that we love Christ and we belong in His Church. Our Church celebrates our Lord’s Cross on many occasions and in different ways. One way to celebrate is to chant a hymn for the Cross: “We venerate Your Cross” or the Apolytikion of the Exaltation of the Cross (see Background section below for the text of the hymns). The Cross has true meaning for us when we act in the way Christ teaches us: taking care of others, and being humble, patient, and obedient. We have created two activity packets for this day. The first one contains activities focusing on a lesson on the Veneration of the Holy Cross. Our second printable packet was inspired by a wonderful Lenten resource, Tending the Garden of our Hearts by Elissa Bjeletich and Kristina Wenger – an Ancient Faith book/audiobook and podcast series of spiritually uplifting Lenten meditations for children and their families. 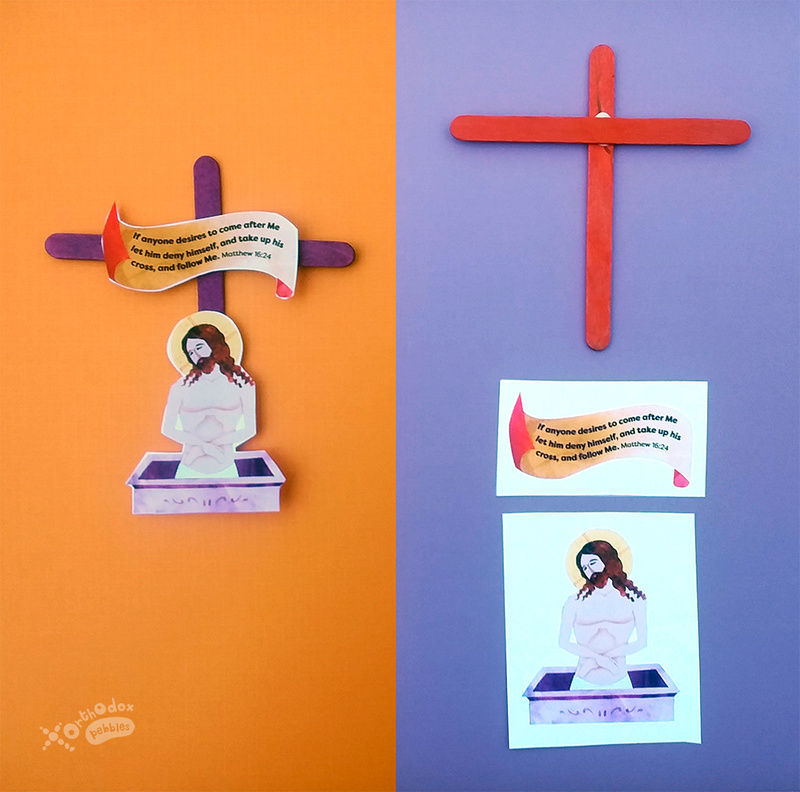 We are sincerely thankful to its creators for allowing us to put together some printables for enriching activities accompanying their content on Great Lent week 4. They can be used both at a family and at a Sunday School setting. In addition to classic activities such as crossword puzzle, fill-in-the-blanks, and a cut-and-glue craft for the younger children, Packet 1 also contains the following craft. Cut out the scroll and the image of Christ. Glue two craft sticks together to make a cross. Glue the image of Christ on the bottom and the scroll on the top part of the cross. The image of Christ in this craft is inspired by the icon “Extreme Humility”. This is a very important and symbolic icon, which does not depict the events of the Passion of the Lord exactly as they happened. It combines the Crucifixion, the Lamentations and the Burial, and has deep theological meaning. The sign above Christ’s head reads: “The King of Glory” (Ο Βασιλεύς της Δόξης). We see this icon inside the Altar, on the Prothesis (Proskomide) table. Elissa and Kristina propose a scavenger hunt that can help the children become more aware of the Cross’s presence in their lives. We created a printable to accompany this activity. It can be printed out and used to count the crosses found on the scavenger hunt. It also contains the troparion of the Feast of the Elevation of the Cross. One page can be used by the whole group/family, or the group can be separated into teams/individuals, with one page each, and at the end compare the results – even make a small friendly contest out of it. To make it exciting for young children, the parents/teachers could make a significant amount of paper crosses and hide them around the house or school so that there are many of them. This activity can help young children learn the troparion. Print out the page and cut out the rectangles. Scramble them up, then the children can try to put them back in order, with help from the previous printable. Bowling: Hide each phrase rectangle under an upside down paper cup. Each child uses a small ball (a tennis ball works well) to knock over the cups. When s/he knocks over a cup, she takes the piece of paper from underneath it, and places it at a designated spot, in the correct order. If doing this activity at a group setting, the children can be separated into competing teams, each with its own set of paper rectangles and cups. Toss game: The phrase rectangles are spread out on the floor. The child uses a small beanbag (a sock filled with rice works fine) to aim at the pieces of paper. When the beanbag lands on a piece of paper, the child takes it and places it at a designated spot, in the correct order. This can be again turned into a small competition between teams, if desired. Basketball: The phrase rectangles are scrambled up and put into a bag, jar, or cup. A container such as a laundry basket is placed on a high spot, such as a table. Each child throws a small ball at the container. If the ball lands into the container, the child gets to randomly pick a piece of paper from the bag/jar/cup, which s/he then proceeds to place at a designated spot, in the correct order. At a group setting, if the child misses, s/he goes at the end of the line and waits for her/his turn to try again. Additional fun activity ideas for using the phrase rectangles to help with memorization can be found at this very useful blog post, by the Antiochian Orthodox Department of Christian Education. In their book, Elissa and Kristina discuss Humbleman, a very special superhero who takes after the Saints – humbleness being his most important superpower. The children are also encouraged to reflect on how we can all act humbly in our daily lives. We were inspired by this discussion to create Humbleman’s toolbox: The HUMBLEBOX. This small box of cards can help young children grasp the concept of humility – and practice it in real life. The Humblebox pages, printed out from our printable packet. An empty Altoids candy box. Scissors, liquid glue or Mod Podge. Premium printer paper is optional, but produces better results. This printable consists of a decorated rectangle for the cover and a number of cards. Some of the cards contain humble act ideas to be implemented by the child. There are also blank cards to be filled in with the parent’s or child’s own ideas of humble acts. The cover is glued onto the box. For a more finished look, it can be sealed with a thin layer of Mod Podge. The cards are kept inside the box, to be used throughout the rest of Great Lent. We venerate Your Cross, O Christ, and Your holy Resurrection we glorify. (part of the Hymn to the Resurrection). O Lord, save Your people and bless Your inheritance; grant victory to the faithful over their adversaries. And protect Your commonwealth, by the power of Your Cross. Coffee with Sister Vassa video series, Ep.23, Week 4 of Lent / Cross. Be the bee video series, Y2AM Ministry of the Greek Orthodox Archdiocese of America, Episode #29, The beauty of the Cross. Sunday of the Veneration of the Holy Cross, web article by the Greek Orthodox Archdiocese of America. On carrying your own cross, Homily on the Third Sunday of Great Lent by St Ignatius Brianchaninov. Special thanks to Sister Vassa and Y2AM for allowing us to embed their videos into our webpage.